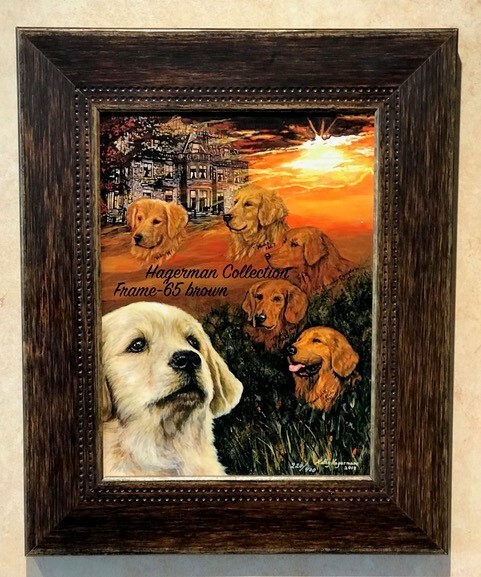 This Special Edition of 400 signed and numbered high-quality prints was inspired by the desire to educate and preserve the history of the Golden Retriever. With 2018 commemorating the 150th Anniversary of the Founding of the breed it was a perfect time to honor their beginning. Guisachan Estate in Tomich, Inverness-shire in the Scottish Highlands is the ancestral home of the Golden Retriever. 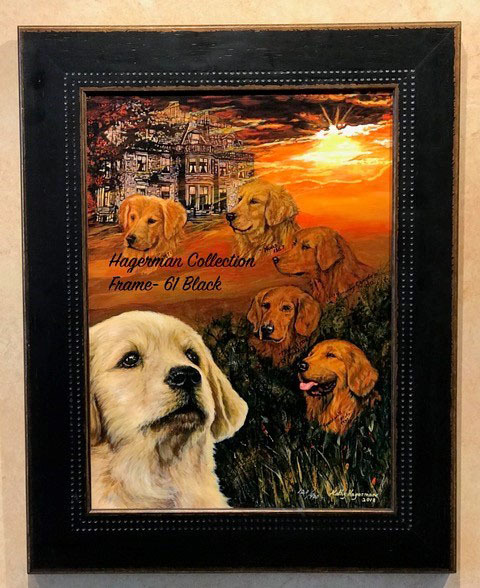 The Friends of Guisachan was established in 2013, a non-profit organization dedicated to informing Golden Retriever owners and the public at large about the history of the breed. In 2014, a 99 year lease was obtained on a small plot of ground on the Historic Guisachan land. A life size bronze statue of a Golden Retriever was commissioned there to commemorate the founding of the breed in 1868. To date they have established a comprehensive website, www.friendsofguischan.org, commissioned the weaving of the historical Guisachan tweed, published a Walking Guide to Historic Guisachan to help visitors to identify historic buildings in the village and learn of their uses in the 1800’s. In July 2018, Golden fanciers from around the world, will travel to Guisachan to celebrate the 150th anniversary of the founding of the breed. 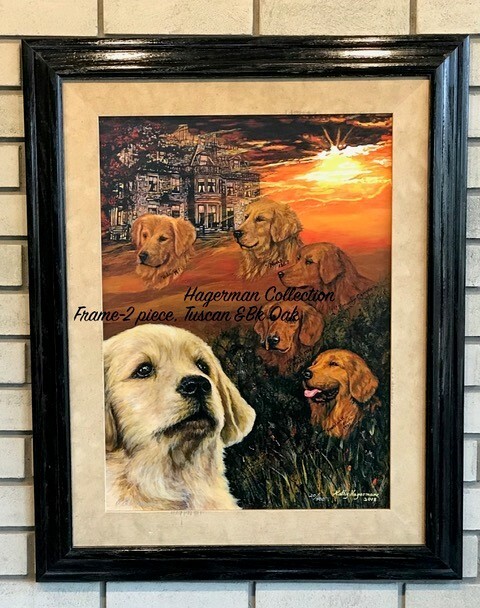 Framed Pieces - will have our special surface that does not require glass, no glare, 5X better UV protection than glass, closest color to Original and ships easily. 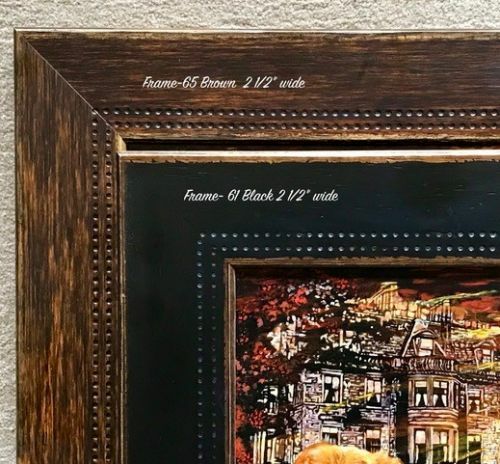 Frames will be offered in black, brown 2 1/2 inches wide. Two piece frames available on L and XL size. The history of the Guisachan lands and the Fraser Clan which owned them dates back to the 1500s beginning with William Fraser,1st of Guisachan. A detailed family history has been published by Donald Fraser entitled Guisachan: A History, upon which this narrative is based. The property becomes of interest to the Golden Retriever community when purchased in 1854 by Dudley Coutts Marjoribanks, later known as Lord Tweedmouth. The Guisachan Estate was approximately 20,000 acres of beautiful lands, ponds and hills. Lord Tweedmouth built a magnificent mansion, Guisachan House, as well as a farm steading, diary, kennels, stables, a laundry, brewery, meal mill, school, and a model village, named Tomich , the latter for the estate’s workers. A working farm, Guisachan was home to Highland and Aberdeen Angus cattle and Highland ponies. Initially, the canine community consisted of pointers, deer hounds and a little Cairn Terrier. The word Guisachan means “the place of the firs” and indeed there were many beautiful trees, including many ornamentals planted by Lord Tweedmouth. Most notable is the Wellingtonia, a giant redwood tree, planted by Lord Tweedmouth in 1868. One hundred and fifty years later, the tree still stands guard along the driveway near the entrance to the mansion ruins. An interesting aside is the fact that Douglas fir trees from the estate were sold to renovate the masts of Robert Falcon Scott’s ship, the Discovery, used in his Antarctic explorations. It is now berthed in Dundee. The estate was sold in 1908 to Lord Portsmouth and placed on the market again in 1919, but there were no bidders. In 1935 the property was sold and divided up with portions going to the Forestry Commission and the village houses sold for private residences. Guisachan House itself had no buyers. In 1939 the mansion was sold to Lady Islington who had the house stripped of all its furnishings and even its fine interior mantles, stairways etc. The lead and slates were torn off the roof and sold and with that, the mansion became a victim of the elements leaving it in ruins as it stands today. A Mr. Michael Waddel bought the property at the end of World War 11, but it was sold again in 1961 to Euan Fraser. In 1966 it was sold yet again to Colonel James Fraser, bringing the property once again in the possession of the Fraser clan through his son Donald. The Guisachan ruins and parts of the original property still remain in the hands of Lady Islington’s heir. The first record for the ordering of the Guisachan Tweed was in 1861 via MacDougall's of Inverness who then commissioned its manufacture at the Johnston Mills in Elgin Scotland. At that time each estate had its own tweed and the staff wore a full suit of the tweed. It is thought the colors were selected to be in keeping with the natural habitat of the estate and to serve as camouflage for those involved in the hunting tradition. In 2014 the Friends of Guisachan commissioned the Johnston Mills to make the tweed (after receiving permission from the Fraser family of Guisachan Farm) in honor of the founding of the Golden Retriever in 1868. The 150th anniversary of the Golden will be celebrated in 2018. Nous - In the early 1800’s in Scotland, sportsmen often trained their setters and pointers to retrieve and it was not until the 1840’s that efforts were undertaken to breed a true retriever. In 1865, Dudley Coutts Marjoribanks, later Lord Tweedmouth, purchased “Nous” a Wavy-coated Retriever, from a cobbler in Brighton, England, the dog having been payment for a debt. Nous, was a “yellow sport” in a litter of blacks bred by the Earl of Chichester. , In 1867, Lord Tweedmouth was given Belle, a Tweed Water Spaniel, by David Robertson of Ladykirk. Belle and Nous were bred in 1868 and the litter included three yellow pups, Crocus, Cowslip and Primrose. 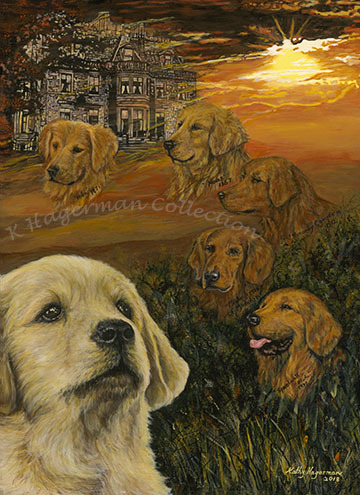 This litter became the foundation of the Guisachan yellow retrievers which were subsequently renamed Golden Retrievers. Seeking to retain the yellow color, he bred Nous and Belle again in 1871, from which the favored puppy was Ada. For the next twenty odd years, some puppies were kept, some given to keepers on Guisachan and other estates and others given to friends and relatives. Cowslip and Primrose were kept, and Crocus was given to Lord Tweedmouth’s son, Edward. Michael of Moreton - Michael of Moreton was born in 1925, and owned by Mr. & Mrs. R.L. Kirk of Moreton Hall , Reddick, England. Michael was of immense importance to the development of the breed in the years between World War I and World War II. He won seventeen Challenge Certificates, the Crufts Show Golden Cup four times and many field trial awards. He was a stud dog much sought after and sired seven Champions and countless show and field trial winners. He was able to reproduce his excellent qualities fostering the dual-purpose characteristics that mark the Golden today. Michael’s beautiful lines were the inspiration for the bronze Golden Retriever statue erected on Guisachan land in 2014, proclaiming Guisachan the ancestral home of the breed. Speedwell Pluto - Sired by the renown Ch. Michael of Moreton, Speedwell Pluto was imported to Canada from the Speedwell Kennels of Mrs. K. Evers-Swindell in England by Samuel Magoffin in 1930. Pluto’s journey encompassed three weeks of travel by rail in England, steamship across the Atlantic and rail across Canada to Winnipeg. In 1933, Pluto, now Can/Am Ch Speedwell Pluto became the first Golden Retriever in North America to be awarded Best in Show at an all-breed show. He also proved to be an outstanding gundog. Today, he is generally considered to be the foundation sire of the Golden Retriever in North America. Copyright © 2014 Kathy Hagerman. The Kathy Hagerman Art Gallery is located in Beamsville Ontario.